In the spirit of the season, today’s post is all about cranberries. You know, those tasty, nutrient-dense, little red morsels … you most likely passed them (or passed them by—folks usually love ’em or hate ’em) around your Thanksgiving table last week. And maybe you’ll enjoy them again at a Christmas feast. Their bright-red hues bring a festive touch to any holiday meal. When I think cranberries, I think New England, where many of the cranberries in the U.S. are grown and harvested. I don’t think my neighboring Washington state … until now. Turns out, Washington state is the fifth largest cranberry-producing state in the U.S. Who knew? This gorgeous slideshow of cranberry production in Washington state will make you appreciate these little gems even more. 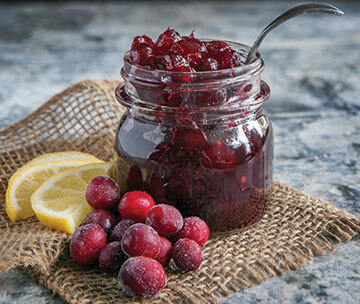 And here’s a holiday-inspired recipe to get your creative cranberry juices flowing! Who Let the Cow In? If you’re allergic to cuteness (or cows), cut your losses and get outta here while you still can. I knew you’d risk it. Izzy is a bit big for house visits now (she makes an appearance in this video). Hmmm … maybe Breanna needs a mini Jersey?